Sausage | Let There Be Food! I have been away for far too long, my food loving friends. I apologize. Sometimes, as we know, life happens. But the good and delicious news is that I am back! And I plan to stay back! As we all also know, I am a big fan of food that you can make ahead of time and freeze to have available at your disposal when you need it. Mayhap it is cooked and only needs to be thawed and reheated. Perhaps it is still raw and needs to be cooked upon defrosting. The details of that depend on the particulars of the situation. However, the more work you can do in advance to help you out when you are short on time, need something to take to work for lunch, are short on energy, or otherwise need a boost in the kitchen, the better. 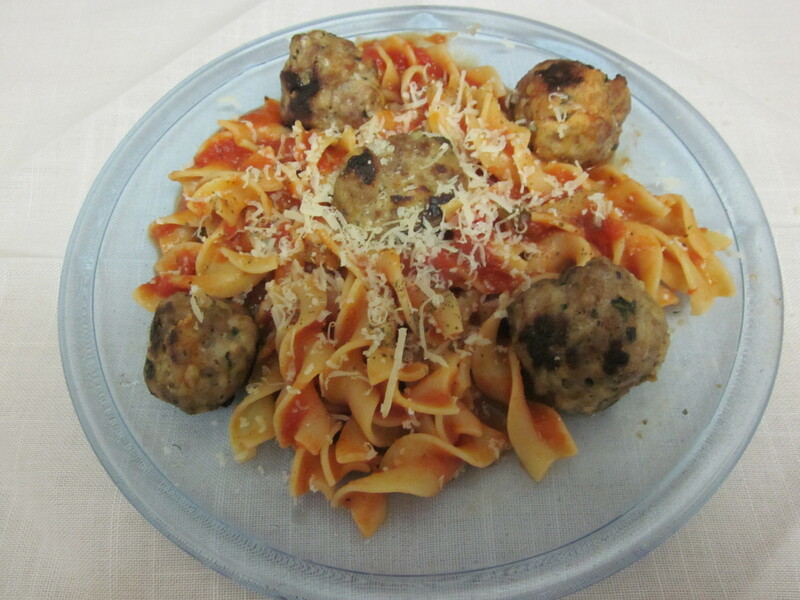 One of the dishes that I’ve recently come to be a fan of in this department is the meatball. You can make a whole passel of them without too much trouble, freeze them right up, and then you have them at your beck and call to parcel out as you need. How beautiful is that?? 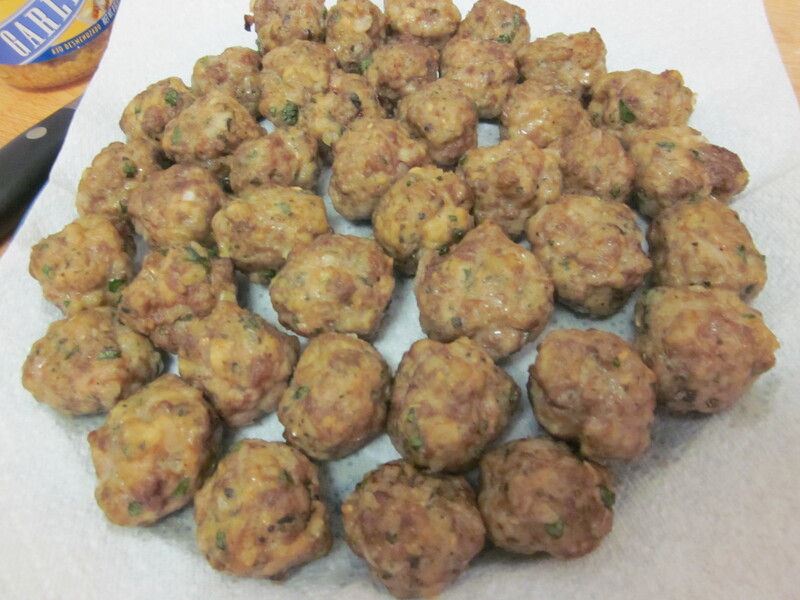 The recipe below is my second pass at these meatballs, and I’ll probably continue to play with the recipe, so keep your eyes and taste buds on the lookout for additional meatball recipes in the near future. 1. 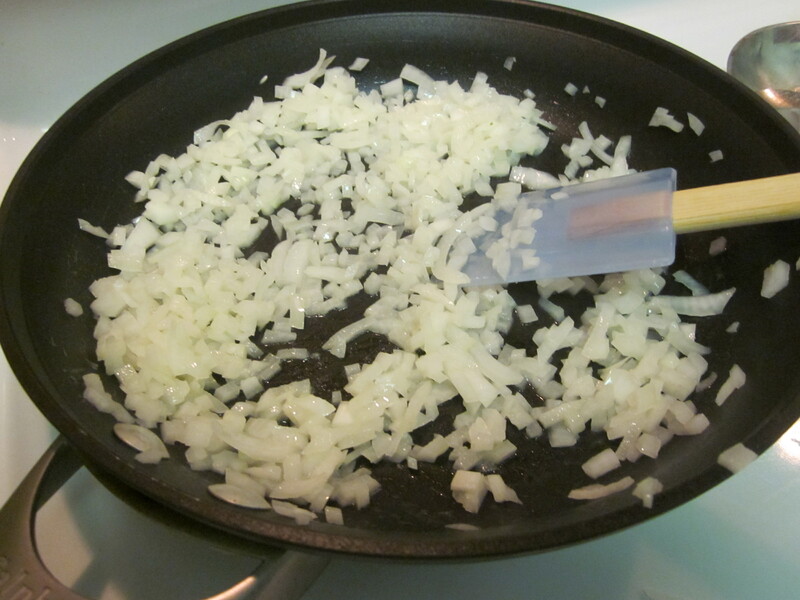 Sauté your minced onions in a little bit of either the butter or olive oil (your preference) until they are soft and translucent. I let mine go until they got just the slightest bit of brown around the edges of a few. Take them off the heat, and let them cool while you work with the rest of the ingredients. 2. 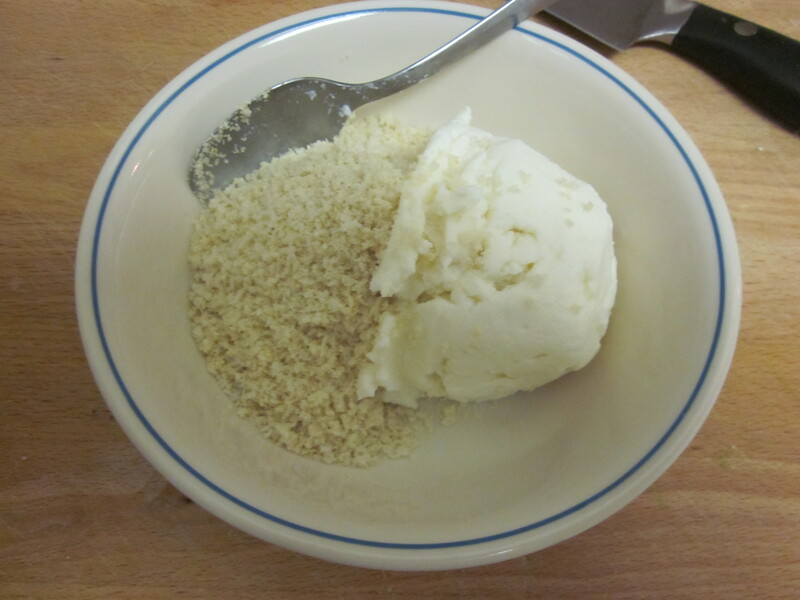 In a regular bowl, combine your ricotta cheese and bread crumbs. They can sit together for a few minutes to combine a bit. 3. 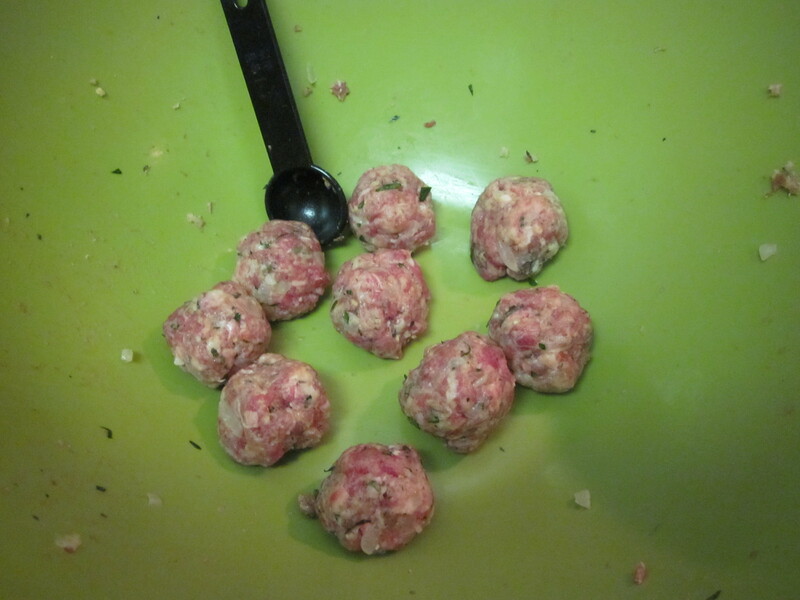 In a large, roomy bowl, put in your beef, sausage, garlic, Parmesan cheese, salt, and herbs. 4. 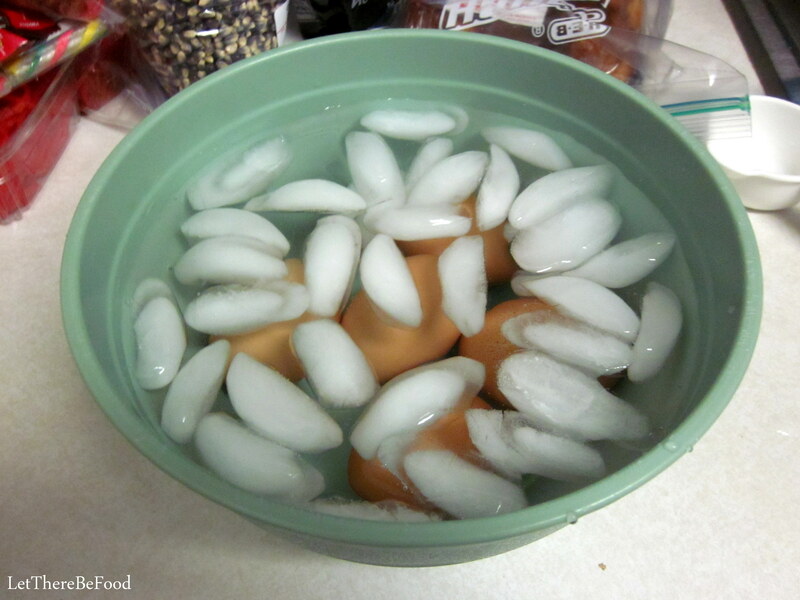 Beat your egg and pour into the bowl. 5. 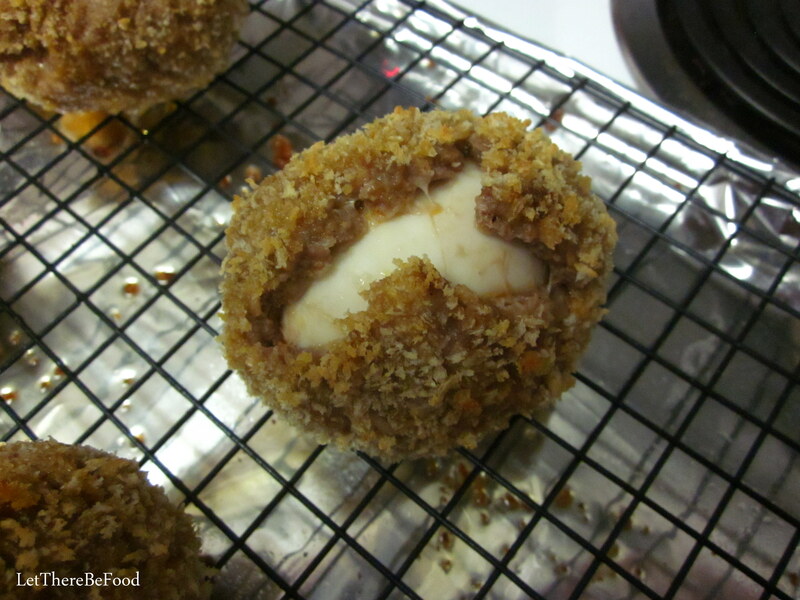 Add the ricotta and breadcrumb mixture. 7. Using your kitchen’s best tools – your hands (how often do you hear that on the Food Network?? ), mix it together. Try to do it quickly and without too many passes through the meat, but also making sure the cheese and herbs get evenly distributed. The less you work the meat, the better. 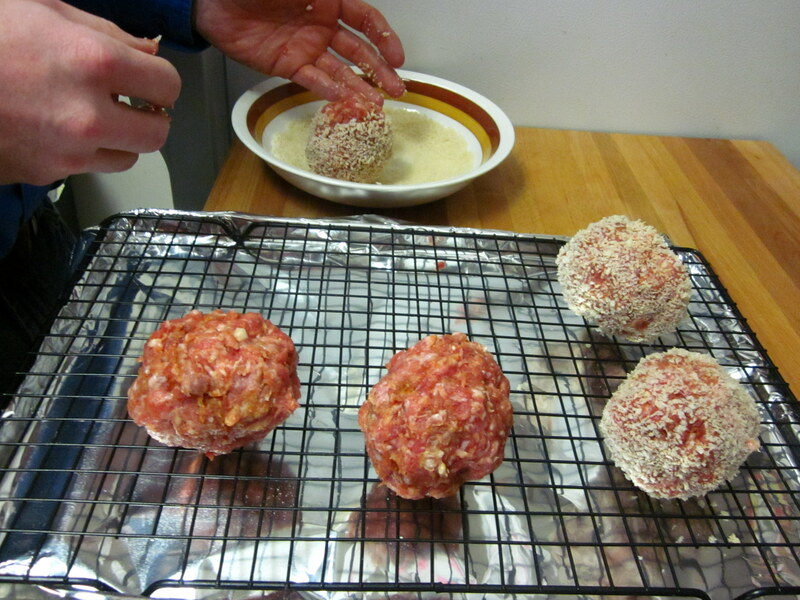 The more you handle the meat, the more likely you are to have a dense, tough meatball. It’s a similar concept to pie or biscuit dough. 8. 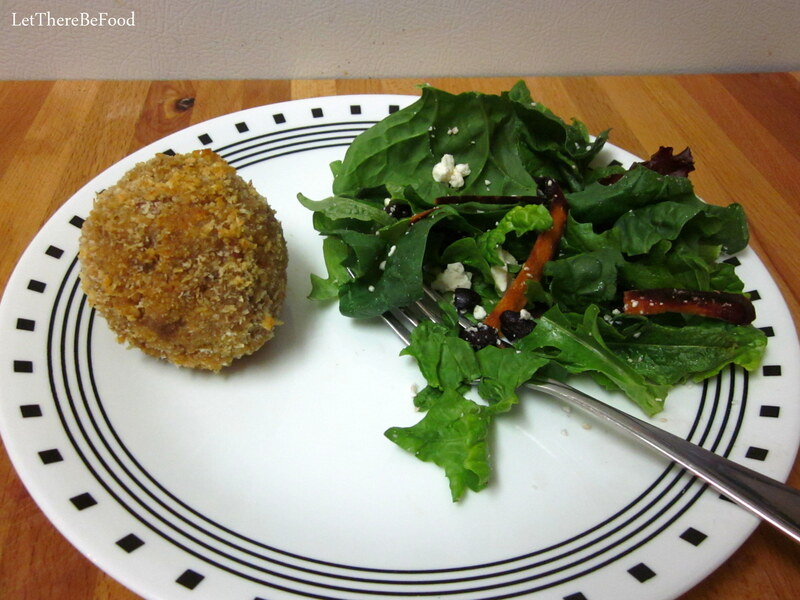 I use a ½ tablespoon measure to scoop out a couple of measures of meat, loosely form them into a ball, and pan-fry them to taste-test for seasoning and flavor. 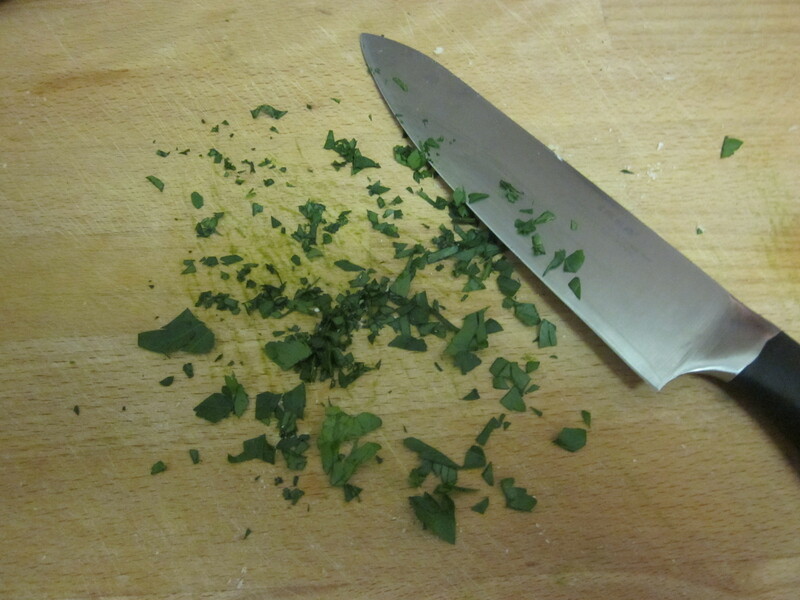 You may wish to add an additional pinch of salt after tasting, more herbs, or more garlic. This is when I adjusted many of my seasonings that made the final ingredient list for your benefit. 9. Once your taste-testing has been done, and final seasonings added and mixed, preheat the oven to 400 degrees, and set a jelly roll pan up with foil underneath a cookie cooling rack. (See picture below for set-up.) Begin to scoop and roll. Scoop and roll. Scoop and roll. 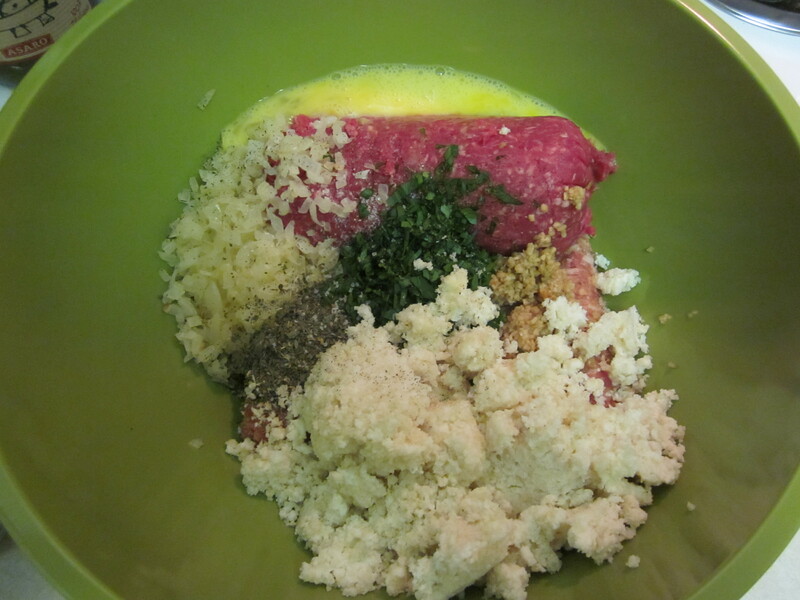 Keep at it until all the mixture has been made into your meatballs. Mine didn’t all fit on the sheet at once, but I rolled them anyway to be prepared. 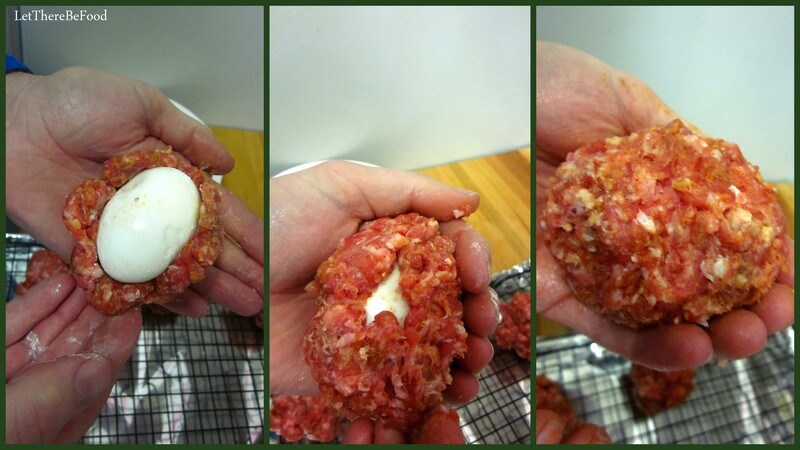 Be gentle when rolling your meatballs. Remember – the less handling the better. 10. Bake for 10 minutes, flip, and bake another 9. Take out of the oven and place on a paper towel lined surface. Repeat if necessary. Let cool just a bit before putting in the fridge. I recommend time in the fridge before freezing. And if you eat some while they are hot, I won’t judge, but mind that they don’t take the top layer of your tongue off. 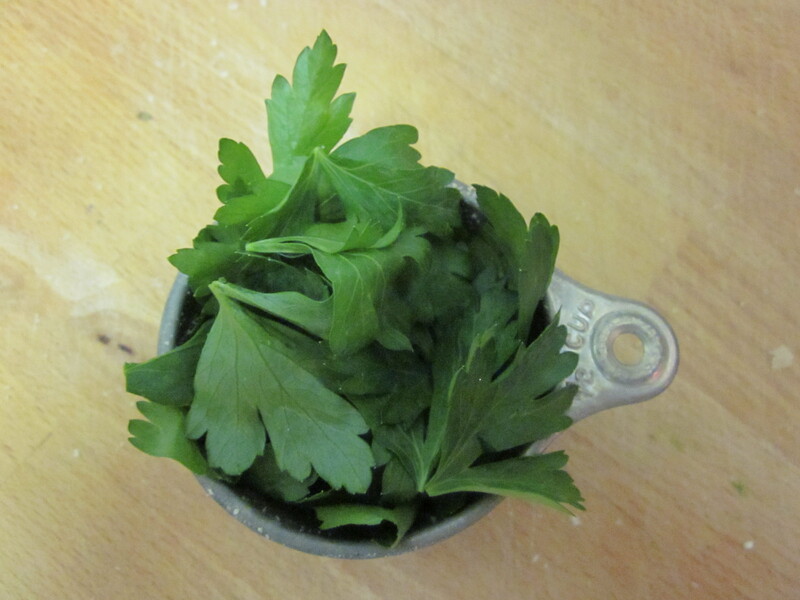 *I used Italian flat leaf parsley because that’s what I had. Really any mixture of Italian herbs would do. 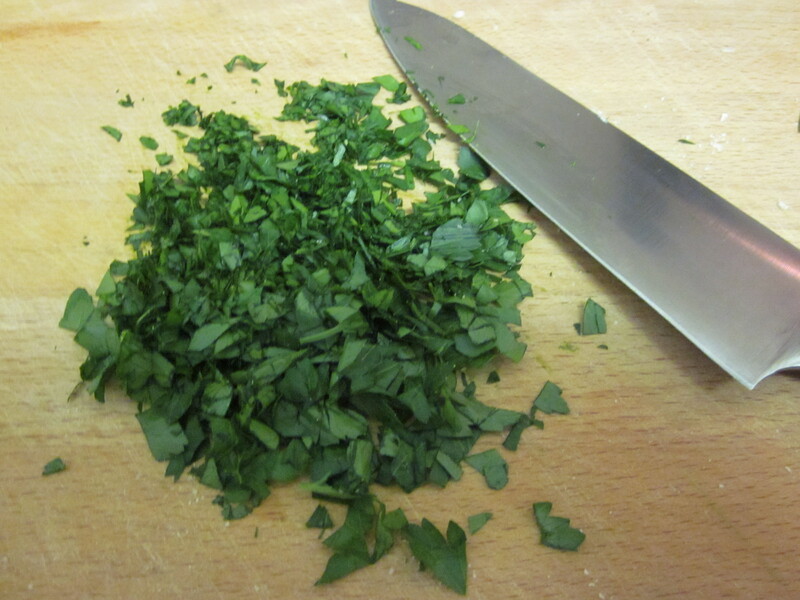 I might use basil if I had some available or oregano or perhaps even rosemary. Use what you have at your disposal. I think it might be hard to go wrong with fresh herbs here. Unless you were using mint. That might not be good eats. An additional note, these are quite onion-y as a cup of minced onions is a fair bit of onions. 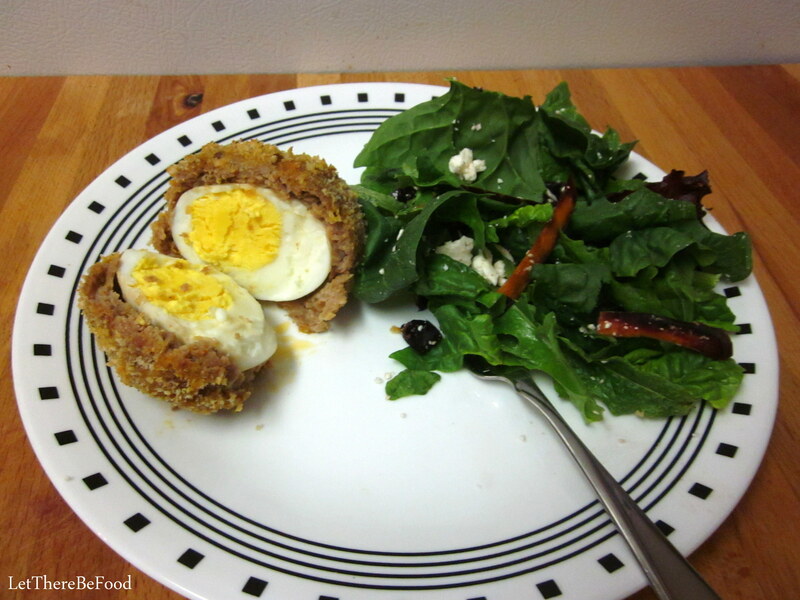 Sometimes when I make a dish the first time, I’m just winging it as I go along and not really measuring at all. 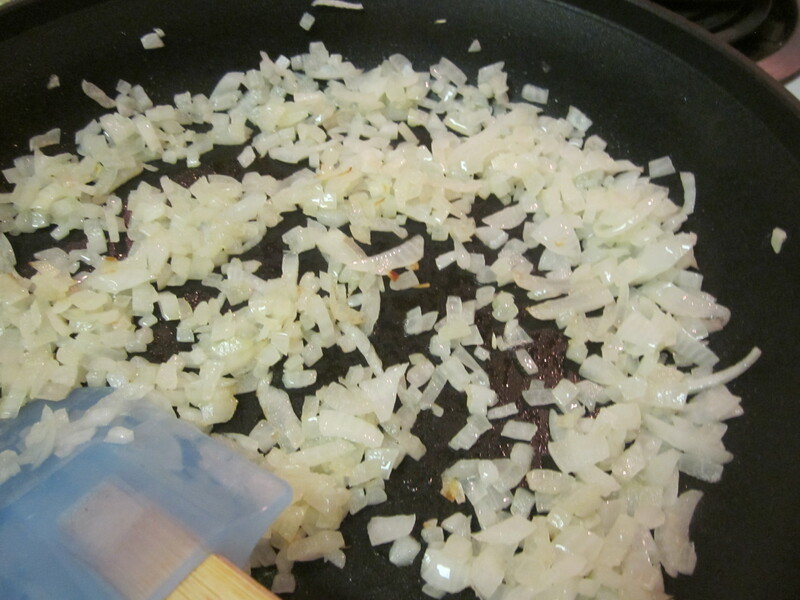 The second time, when making for the blog, I usually tend to over-measure which I think I did with the onions. I like onions so I am okay with it, but if you are less of an onion fan, you might want to consider reducing that amount. I may even reduce it the next time around to let other flavors shine through. However, the boyfriend who is frequently in the anti-onion camp was just fine with them, so it just might be alright. The rationale for my advice to you for letting your meatballs spend some time in the fridge prior to putting them in the freezer is fairly simple. You don’t want to put warm or hot food in the freezer next to other foods where it could bring the temperature of said food up. Certainly it won’t unfreeze, but if it gets a little melty and refreezes around the edges, that’s not good for your food. I’ve never done this myself, but I would be suspicious that if I put too much hot food in my freezer at once, it would be quite negative for the overall temperature of the freezer. Thus, I put slightly cooled foods in my fridge to cool all the way down. That is bacterially safer than letting it cool all the way down on the counter. I try not to put warm food next to anything dairy in the fridge, or near anything that makes me nervous in my gut for heat transfer. If possible, I’ll put some space around the cooling food to help with air circulation. Food safety first, people. One of the reasons I choose to go with such a lean ground beef in this recipe is because the Italian sausage has quite a bit of fat in it. It is, after all, sausage. It more than makes up for the lack of fat in the ground beef, and the ricotta also helps keep the meatballs from being dry. Please don’t be afraid of using a lean beef in conjunction with the sausage. I promise, it is okay. I’m even considering exploring turkey with the sausage. I know that’s a little odd, but hey – someone’s got to try it, right? I can take one for the team. 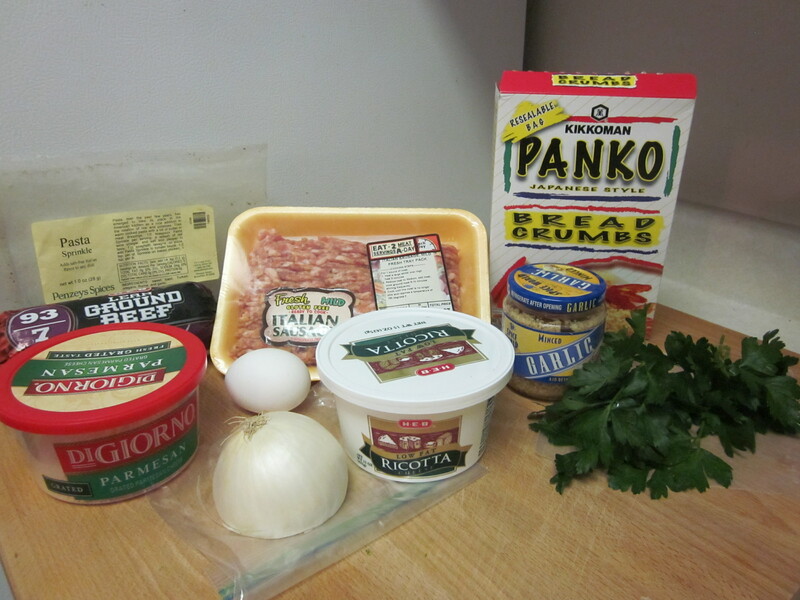 My grocery store carries the Italian sausage ground without the casing which is quite handy. If you can’t find that, just get mild Italian sausage with the casing, and then cut the meat out of the casing, dispose of the casing, and proceed onward. It might be tasty to explore a flavored Italian sausage here as well. LOTS of possibilities! My recipe made 54 meatballs, all told. I think this is fantastic because now I’ve got tons of frozen meatball goodness in my freezer, and they are small enough to defrost quickly after work on a night when I was forgetful to pull something else out, or they can thaw in the time between breakfast and lunch so I can eat them for lunch at work. And friends, let me tell you, my last batch smelled so good that my co-workers were perpetually jealous of my lunch every time I heated up these meatballs. They were that good. 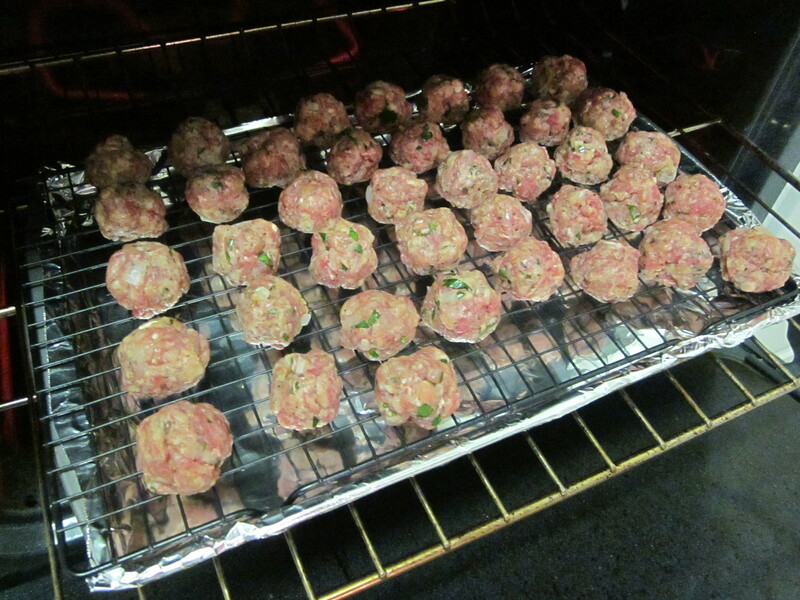 Fifty-four meatballs will last the single eater (or even double eaters) quite a while. It’s such a great plan-ahead item. 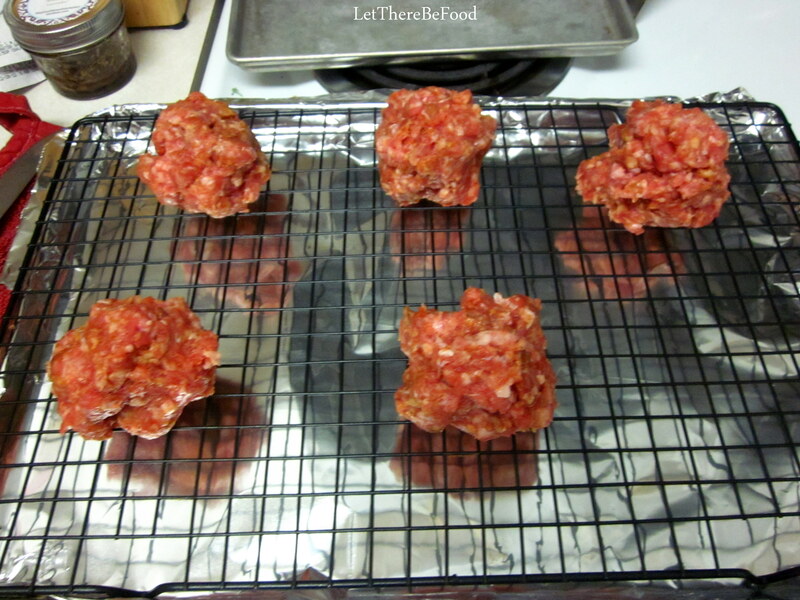 And with lots of room for improvising, I can’t wait to hear how you made these your own meatballs! Happy Eating!